The BCFO Bird Records Committee continues its hard work reviewing sightings of the province’s rare birds. The latest set of decisions includes three new species added to the provincial main list. Follow the link here or use the drop down menu above – BRC Public. 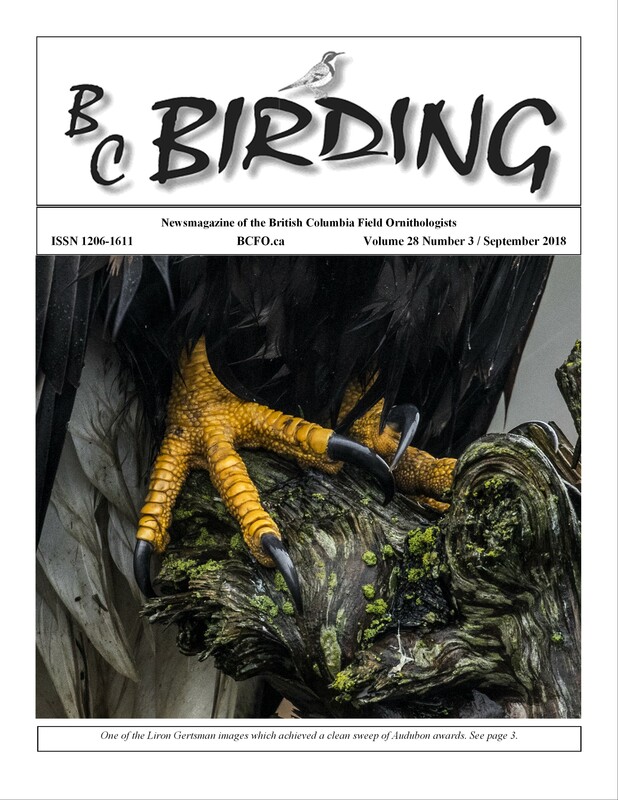 The September issue of BC Birding is now available in the Members’ Area. In its 34 pages it carries news such the recent triumphs of BCFO Young Birders, reports on the Hope meeting, information on upcoming two-day trips, trip reports on distant and not-distant places, all the usual features, and 43 great photographs. Be sure not to miss the tale of Harold the Hirundine Hero. As part of the parallel programs running in conjunction with the International Ornithological Congress 2018, happening later this month in Vancouver, BCFO members are invited and encouraged to participate in the Stewardship Roundtable. Hosted by the Stewardship Centre for BC and Bird Studies Canada, the Roundtable on Friday, August 24, 2018 will be a forum and showcase of innovative practices championed in our province and beyond. Please register by August 12th. Registration is only $20 and includes access to sessions described below, coffee, lunch, and a networking and poster session. Visit the website https://stewardshipcentrebc.ca/register-for-srt/ for further information and to register. The program includes the following offerings covering a range of interests. Birds and Building Collisions: Learn about how and why birds collide with windows. What factors influence the risk of collisions, and what practical solutions exist. Join the discussion with architects, practitioners, municipal planners and more. Cats and Birds Living in Harmony: Navigating the issues around cats’ impacts on birds demands a non-traditional approach; the human dimension is a key part of finding solutions. Participants will learn best stewardship practices, not only for the welfare of cats and birds, but also for managing the many challenges facing individuals and communities. Climate Change Adaptation for Birds and Wildlife: This session outlines how climate impacts continental-scale bird migration and the ways communities and municipalities are responding. Co-Benefits of Agricultural Lands as Bird Habitat: Productive agricultural land tends to overlap with important habitats for birds and other wildlife. This session explores some ways farm and ranch lands can continue to support healthy populations of aerial insectivores, grassland birds, waterfowl, and raptors. Urban Habitat for Wildlife and Birds: Humans place pressure on urban landscapes, including private backyards and public parks. Join us for a discussion of the challenges and opportunities to improve habitat for wildlife and birds while restoring these areas. traditional food and cultural practices. BCFO’s Bird Records Committee (BRC) is presently finalizing details of its soon to be published 2018 Checklist of BC Birds. July is the target date for publication, and we are looking for a cover photograph or image for this completely revised and newly formatted checklist. With the work of the BRC continuing apace, many new birds have been added to the database since the last checklist was published in 2007. Given that the Steller’s Jay is BC’s provincial bird, and also the featured bird in our BCFO logo, it can’t be a surprise that we’re looking for a Steller’s Jay photograph or graphic image suitable for the cover of the checklist booklet. Only BCFO members are eligible to submit photographs or images and all members are encouraged to do so. The final decision will rest with the BRC, which will work with a small committee of members to make the final recommendation. There are no prizes on offer here, just the chance for fame, international recognition, and kudos from all around if your image is selected. Please submit photos or images at 1000 pixels in the longest dimension. A larger file size may be requested for final printing, which will be in colour. The deadline for submissions is 07 July 2018 and submissions should be emailed as an attachment to: bcbrc.chair AT gmail.com (replace AT with @; no spaces) under the subject Steller’s Jay. Last weekend’s (June 1 – 3) Annual General Meeting held in Hope featured many highlights. There was not only excellent birding, but efficient and effective meetings, lots of friendly socializing, a wonderful facility with delicious food supplied by the Hope Golf and Country Club, and outstanding field trips. Intimating the good times ahead, sights and sounds of nesting Merlins, right outside the conference centre, greeted delegates as they arrived. Important business was conducted, including the adoption of a new constitution and by-laws. BCFO is now fully compliant with the new BC Societies Act. Our new President is Marian Porter from Saltspring and new Vice-President is Gary Davidson from Nakusp. Otherwise, the Board of Directors remains unchanged. Our Saturday afternoon talk was a highly engaging look at the nesting behaviour of Turkey Vultures as filmed and described by David Manning in his presentation “The Old Man and the Vultures”. Our banquet speakers Kelly Pearce and Scott Denkers entertained the crowd with a talk entitled “The Bird Blitz Legacy” which covered both the history of and data collected during the Manning Park and Skagit Valley Bird Blitzes. A total of 105 species of birds were seen over the weekend, with highlights including a Black-chinned Hummingbird in Hope and Northern Waterthrushes at Silver Lake and Manning. Look for more detailed reports on the conference, the field trips, and the outstanding pre-conference two-day trip to Princeton in the next issue of BC Birding. 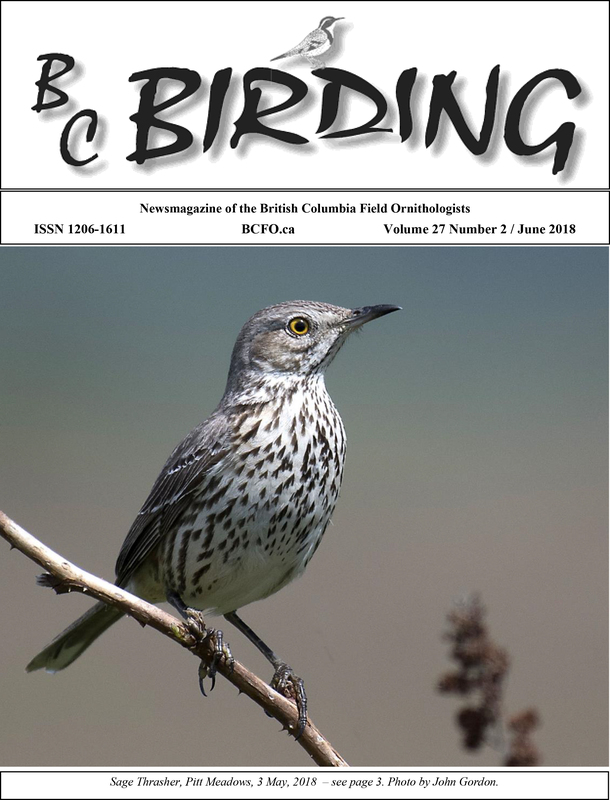 The June 2018 issue of BC Birding, our newsmagazine, is now available in the Members’ Area. Hard-copy subscribers will receive their copy by post as soon as possible. This colourful 32-page edition includes some BCFO news, updates on the IO Congress, numerous encounters of the avian kind, reports on several overseas trips, all the usual columns and features, and 42 remarkably fine photographs. Looking for rare birds? Well, the BCFO Bird Records Committee certainly is. Or, to be more accurate , the BRC is looking for reports of rare British Columbia birds that you may have seen, or know about, but just haven’t got around to reporting to the committee yet. As an incentive, BCFO is announcing today a contest to win free memberships in the organization. Open to everyone, details of the contest are linked here, or you can follow the drop-down under BRC above. On the contest page you’ll also find a sample completed Rare Bird Report Form, and a handy set of guidelines to support your documentation of rare bird sightings. Start digging out those notes and photos! There are a number of significant announcements this week from the Bird Records Committee. Firstly, BCFO is pleased to welcome to the committee its newest member, Catherine Craig from Revelstoke. Catherine fills the vacancy on the committee created when Jeremy Gatten completed his terms as a committee member. Thank you, Jeremy, for all your hard work and contributions to the committee’s operation and effective functioning. For more information about the committee and its make-up follow the link here. Now available for your rare bird records submissions to the committee is a revised Rare Bird Report Form that enables easy, on-line submissions directly to the BRC. Also on the same page you will find the latest Review List (with minor revisions), which outlines birds that the committee would like to receive reports on. Of course, in addition to the Review List species, potential new birds for the Provincial List are most welcome. The BRC Sightings Database has also been updated with both a taxonomically-sorted, and record-number-sorted lists. 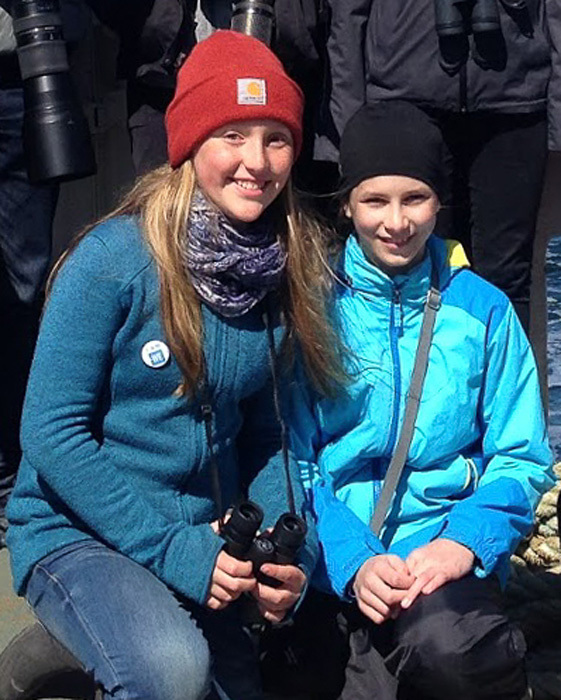 The BCFO Young Birder Program welcomes talented young birders into the BC birding community, and provides them with opportunity, encouragement, and mentoring. • been nominated and sponsored by a BCFO member and approved by the Executive Committee. The Awards Program, now in its fifth year and totalling 27 awardees, continues to grow as we find many young, keen, committed birders from around BC. Each recipient receives a free membership to BCFO until age 18, a memorial plaque, and a stylish BCFO ball cap. Daniel first distinguished himself when he managed to see all three species of Ptarmigan: Rock, Willow, and White-tailed during a family vacation in Northern BC. Daniel has gone birding in several locations, including China, where he got fifty lifers in one day with his Uncle Tom. His favourite places to bird are Tuyttens Road and Cheam Wetlands Regional Park in Agassiz. He has volunteered at the Fraser Valley Bald Eagle Festival in Harrison Mills, and at Cheam Wetlands where he has helped clean the park after an ice storm, and helped in building the south entrance to the park. Every year he participates in the Chilliwack and the Abbotsford Christmas Bird Counts. His uncles Jim and Dave Beeke mentor him and help him with bird identification questions. He has been birding for six years and participates in the Fraser Valley Birding forum and enjoys posting photos to his Flickr acct. He uses eBird every time he birds, and is passionate about citizen science. His favourite type of birding is to scan a large flock of birds to find which species is different. He loves that challenge. 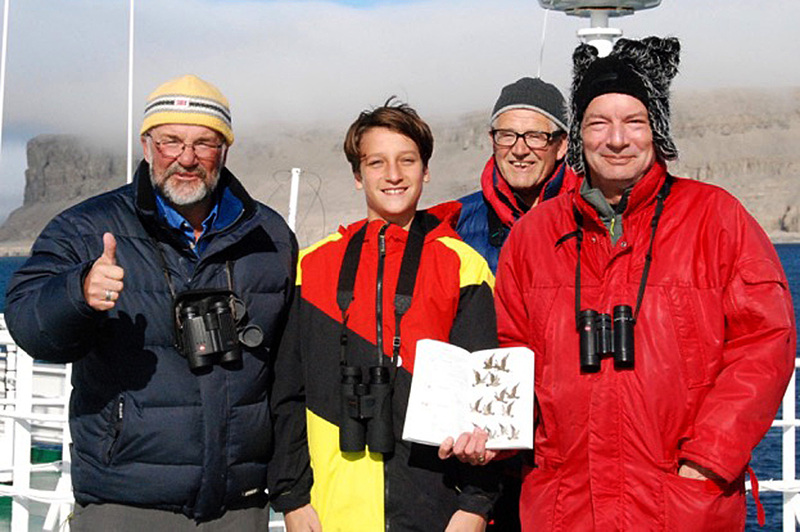 His entire family are birders and have helped to inspire him to be the birder he is today. 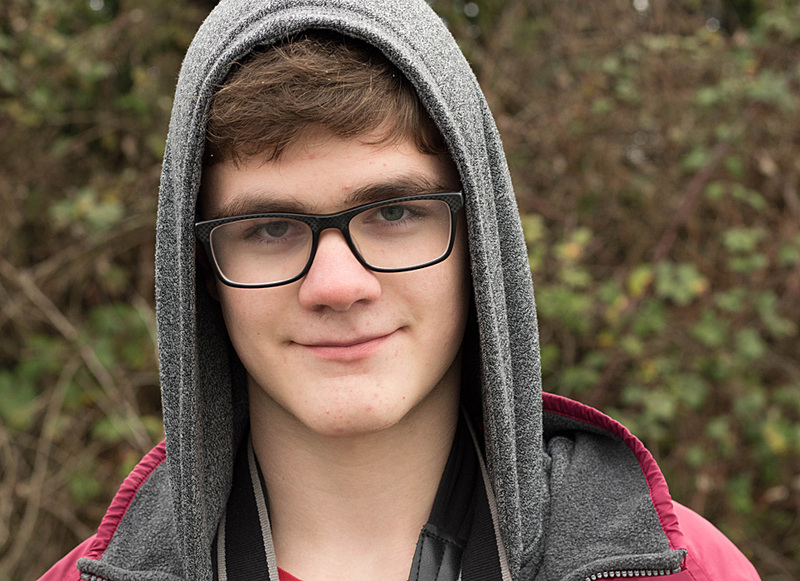 Zac has long been an enthusiast birder and been eager to learn about the natural world. Zac has developed and advanced his understanding of wildlife in his travel adventures, and his more local recreational pursuits. 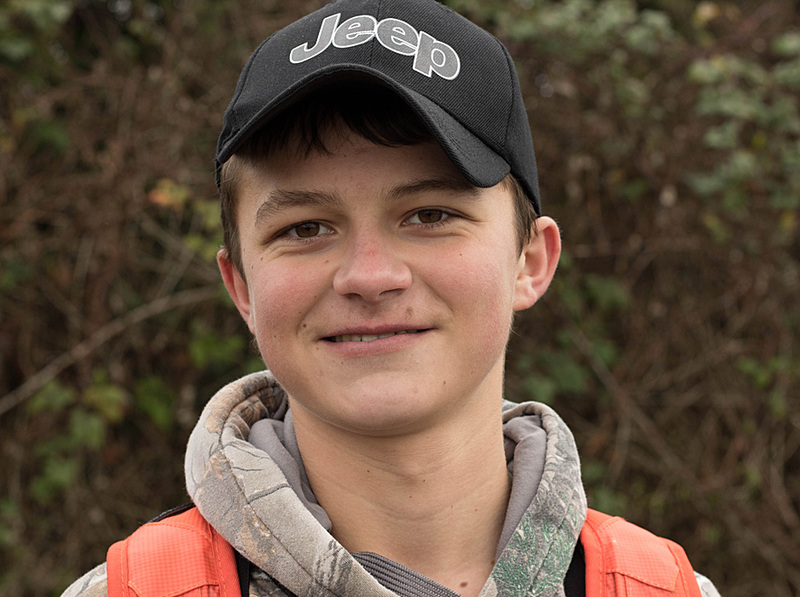 Zac is a promising and already talented young naturalist and birder, and he’s following a fulfilling path that will benefit himself and ensure the conservation of nature in general. This award will encourage him to continue on this path. I recently gave a lecture to a grade seven class to introduce them to birding, and I organized a one hour activity about birds with them. I am also returning to Costa Rica this summer for six weeks to do some research, hopefully on birds. As an active member of the global birding community, I have also been birding around the world (Costa Rica, Portugal, France, Spain, Israel, Hungary, Czech Republic, Slovakia, Austria, Canada, the U.S., etc. ), and have participated in birding tours in most of these places. As well, I have participated in Christmas Bird Counts, and in eBird’s Global Big Day. I have emailed sightings to Melissa Hafting for BC Rare Bird Alert. I have introduced birding to my family (close and extended), and to friends. All these things advance the birding community as I contribute to the global knowledge of birds and help spread this knowledge to others. By making connections and participating in birding around the world, I am also bringing the birding community closer together. Cedar first demonstrated her enthusiasm and knowledge of birds on the September 2017 Ucluelet Pelagic trip when she was quick enough to spot the Manx Shearwater that hardly any adults were able to get on. She is a very intelligent, sharp birder with an engaging and humorous personality. Very good at species identification, she loves to bird with her best friend Toby Theriault (2017 Young Birder Award winner). However, she is also a fantastic solo birder, having found a Tropical Kingbird this year in her hometown of Tofino, and has a BC list that many adults could only dream of. She has done several pelagic trips with her friend Adrian Dorst and has seen many Black-footed and Laysan Albatrosses. Living in Tofino, a great migrant trap, she has spotted many of the rarities that frequently show up there. Cedar also loves to bird with her friend and mentor Ian Cruickshank, who has taught her a lot about birds. Cedar went on a trip to Manning Provincial Park with the Delta Naturalists in August 2017. President Tom Bearss commented that she was so good she became the leader for the group of 10 adult birders on the tour. She spotted all the birds and plants, and explained them well to everyone. Truly impressive at 13 years old. She is another young birder in the province who will make us proud for many years to come. Kalin is a generous and helpful young birder. The nominator first met him while twitching a Little Gull in Penticton. As soon as she got to the lake to open up her scope, Kalin came running to show her where the bird was. He had also found an American Dipper there as well. As they looked at the Little Gull together, the knowledge he showed about the species and about all the birds present on Okanagan Lake was impressive. He knew the migration routes and nesting behaviours and other fun facts about the Little Gull. He loves to bird the ABA area and recently went to Baffin Island and Florida. He is an amazing photographer and his website is here: https://www.instagram.com/BIRDZ.OKANAGAN/ Kalin birds almost daily near his home in Kelowna and he is very passionate about bird conservation. Under every photo he posts to Instagram, he educates the reader about the bird’s plight and issues the species is facing. He also provides little known informative facts. He definitely is a future conservation leader and nature steward for the Okanagan and Province of BC. Jason, whose favourite type of birding is owling, has a vast knowledge of birds. His volunteer work includes the Chilliwack Christmas Bird Count in which he has participated for 5 years. He has also volunteered with the Eagle Festival in Harrison Mills. Jason uses eBird every time he goes birding, and is passionate about citizen science. He loves to bird with his cousin Daniel (also nominated in 2018). His uncle, Dave Beeke, is his birding mentor, and has taught him a lot about birds and identification. His whole family loves to bird and is very supportive of his hobby. 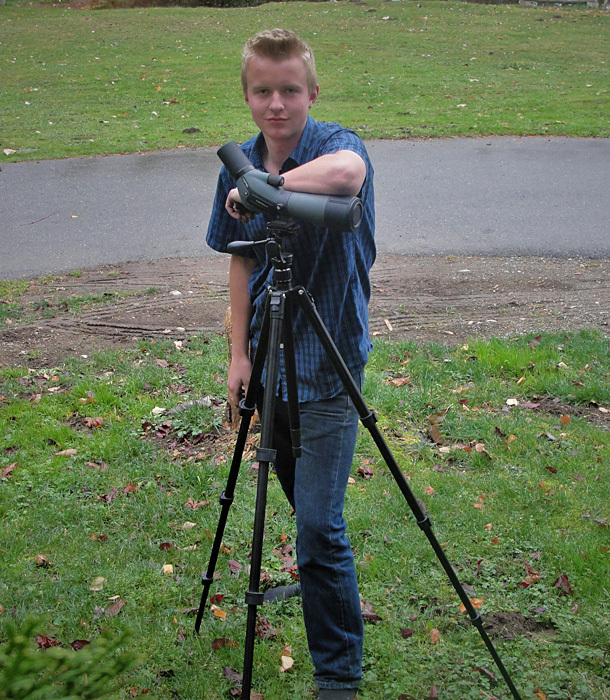 Jason will be a valuable contributor in the future to BC’s birding community. Marnix loves to count birds and particularly loves to come on hiking field trips in the mountains. He volunteers to do trail clearing with the Langley Field Naturalists. A polite, helpful and respectful birder, Marnix knows a lot not only about birds and their identification but he is also proficient in the identification and habits of amphibians and mammals, usually the first one to spot a Pika or Hoary Marmot on hikes to spot ptarmigan. Marnix enjoys working on the farm at home where he raises calves, sheep and rabbits. He has found many uncommon birds on his property such as Townsend’s Solitaires, House Wrens and White-winged Crossbills. 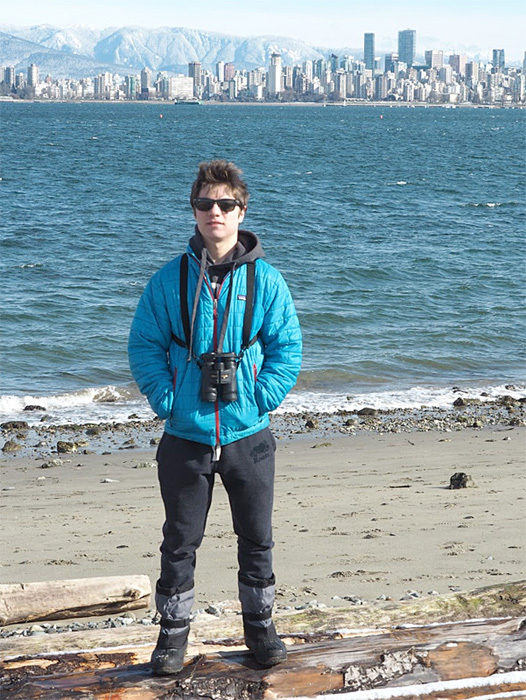 As a well rounded nature enthusiast, Marnix will no doubt continue to add to the understanding of BC’s wildlife and birdlife.